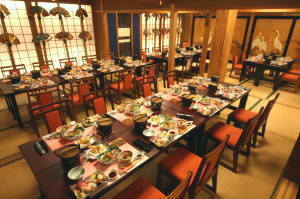 The warehouse of the Edo Period was made a restaurant. 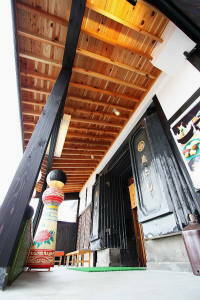 Our restaurant buildings are time-honored storehouses called “Kura,” built about 170 years ago. A Kura is a durable building with very thick walls, made from timber, stone, soil, and straw. 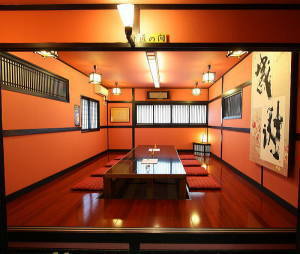 These fireproof walls are thick enough protect valuable items such as rice, grain, and sake from theft. It also protected them from moisture and natural disasters. When these Kura were built there was a large sake brewery located at this site. It stretched from the nearby Yokomachi intersection to where Restaurant Kurayoshi is now. At that time there were a total of seven Kura present, but the two composing Restaurant Kurayoshi’s current structure are all that remain. 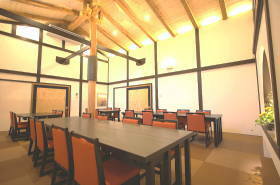 Both Kura are used for guests’ dining, although the recently remodeled southern Kura is only available to guests who have reservations.